The Marangu Route is also known as the Coca Cola route and is said to be the easiest way to climb Kilimanjaro. But don’t be fooled- the highest point on Kilimanjaro is still 5895m/ 19340ft above sea level! This route might well be easier than the other routes, but that doesn’t make reaching the top easy. The Marangu route is the only route where climbers overnight in huts. Whereas many other companies offer 7 day packages, we have already included an extra day on the mountain to help you acclimatize. The climb itself takes 6 days and 5 nights and we include one day before and after the climb in a comfortable hotel in Arusha. Our transfer driver will be at the Kilimanjaro Airport to meet you and to transfer you to your hotel in Arusha. The rest of the day is yours to relax and acclimatize around the swimming pool at the hotel, or you can explore the town of Arusha. You can either walk into town or take a short taxi ride. In the evening our team will give you a briefing at the hotel in preparation of the upcoming trek on Kilimanjaro via the Marangu route. You will be picked up at the hotel just after breakfast and transferred up to the Kilimanjaro National Park Gate (1860m). 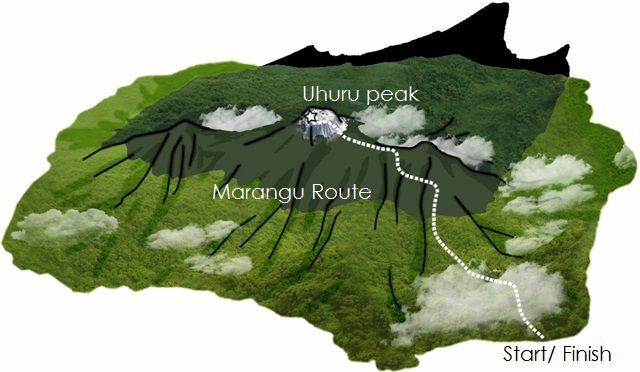 Once all the paperwork has been completed, your Marangu Route climb can begin and you will soon be hiking through the dense rainforest via the Marangu Route. Apart from the impressive vegetation, you might be lucky enough to catch a glimpse of the black and white colobus monkeys. Around 4 hrs later you will reach your destination of the day – the Mandara Hut. After a well earned rest, your guide can take you to the Maundi Crater where you can enjoy the wonderful view of the Kenyan interior. Evening meal and overnight stay at the Mandara Hut (2650m). The day begins with an early breakfast. Shortly after you have left Mandara Hut you will reach the timberline and then enter the heath and moor zone. Around 4 – 6 hours later, the Horombo Hut will come into view – standing at an altitude of 3700m. From the hut you will have fantastic views overlooking Mawenzi, Kibo and the wide plains of the Masai steppe. Evening meal and overnight stay at Horombo Hut. This day serves as an acclimatisation day. This day should not be underestimated and greatly improves your chance of success in reaching the summit. After a relaxing breakfast, a 4-5 hour trek follows to the Zebra Rocks (4020m). The distinctive black and white stripes give the rock formation its name. On your return to Horombo Hut, a warm lunch will be waiting for you. You can relax in the afternoon and regain your strength for the hike the following day. Overnight and evening meal at Horombo Hut. Today is “The Big Day” – the summit stage. Your summit attempt begins at night when the lava ash is still frozen and walking on it is easier. The mountain guide will wake you up at 23:00 hrs and an hour later, you will begin the long and strenuous trek to the summit. Passing the Hans Meyer Cave at 5220m, the climb slowly but surely goes upwards. At sunrise you will reach Gillman’s Point (5681m) on the crater rim of Kilimanjaro where the sun will slowly start to warm up the land. You will soon forget the cold of the night and after a further hike of 1 – 2 hours, you will reach Uhuru Peak at 5895m! At this peak you can celebrate reaching the “Roof of Africa”. The route back down follows the same path; the lava ash will now have thawed and allows for a fast descent. On your return to Kibo Hut, a warm meal awaits and you can regain your strength. After a 1 – 2 hour break you will once again be on your way hiking to the Horombo Hut (3700m) where you will arrive in the afternoon. After an evening meal, most climbers retire to bed early. The last stage passes through the heather and moor zone to the Mandara Hut (2,700 m) where a cooked lunch awaits. Soon you will be in the lush tropical rainforest and after about 6 hours of trekking you will be back at the Kilimanjaro National Park gate (1,860 m). After saying goodbye to your mountain crew you will be transferred back to your hotel in Arusha. At the hotel you can have a warm shower and celebrate your success in reaching the summit of Mt Kilimanjaro. Your adventure officially comes to an end after breakfast. You can continue with your travel plans or be transferred back to Kilimanjaro Airport.